Here is picture of the happy family who, although we had trouble bonding with, grew increasingly more comfortable with and accustomed to living with. 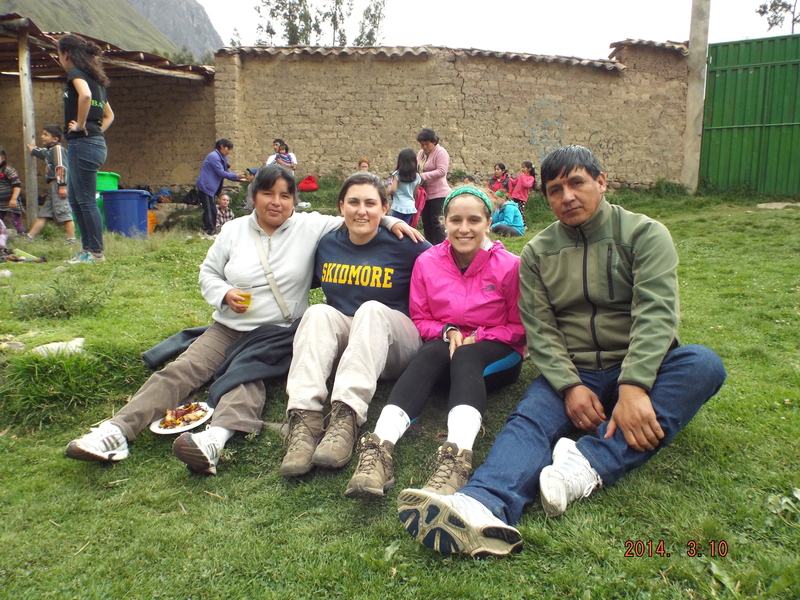 I realized over my 6 days with Poncho and Babina, that I never really felt in my comfort zone, but I learned so much about life of the people in Ollantaytambo. The most important thing I took away from them was that people share and spread love all around the world no matter the circumstance, level of education of financial situation. I feel truely bless to be pushed into this opportunity where I would take so much. Even though we were maybe not the greatest match for each other, I am really thankful they were able to open up their home and open up my eyes to their lifestyle. Over the next few days, we started our service project. It was very exciting! 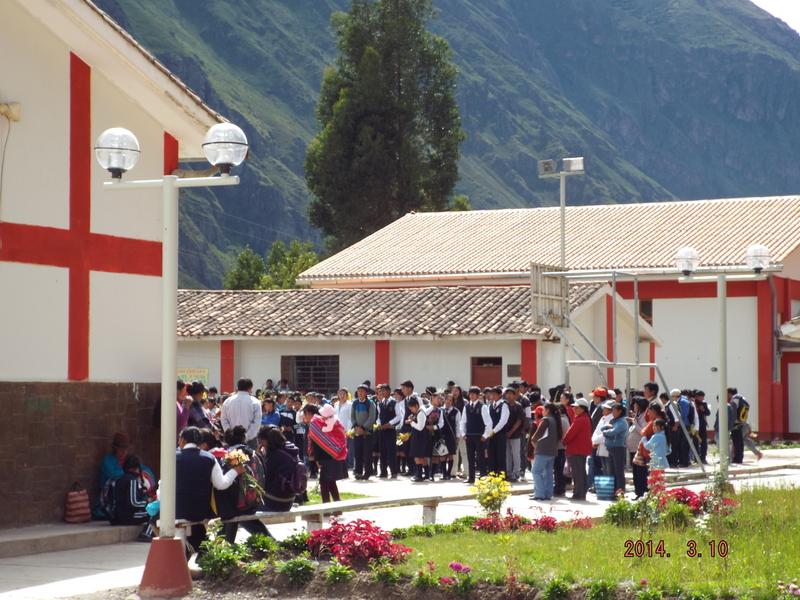 The town of Ollantaytambo had just finished a brand new high school. It was beautiful, and everyone was so excited for the opening day! Our task was to help build a wall on the back side of the school. Over the next couple of days we would unload 1,000 cinder blocks from the back of a truck, move 2,000 cinder blocks from the front of school to the back of the school where the wall was being built, carry dirt, cement, and rocks and get very dirty. It was quite the task. Our group had moments of high tension, laughter, arguments and collaboration. My one wish for the trip would be that we could have made more of an impact on the wall, but unfortunately because of the time consuming labor we didn’t get to see it finished. Overall it was a wonderful experience because we all really came together as a group. Here is a picture of the first opening day of school on our final day of service! It was so great seeing how excited the kids were to start classes! The most influential experience over these few days was the Weaving Community. On March 6th, after a long morning of service, we boarded a little bus and took a very bumpy, very scary ride up the side of a mountain to the community. It was incredible. The women were seated, all in traditional dress, working very hard on their pieces. We all gathered and watched them, snapping pictures and listening to our guide explain their lifestyle to us. 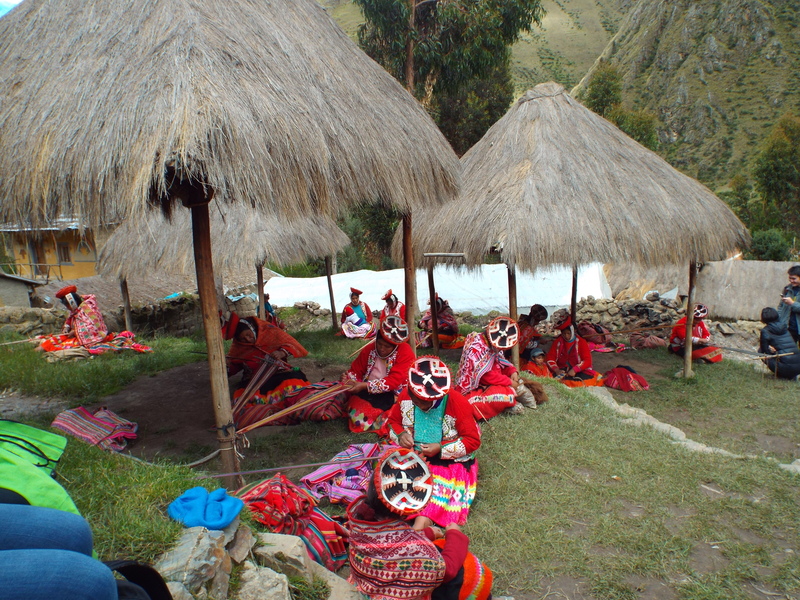 They used all natural dye’s and carefully spun the llama fur into beautiful yarn. We were each paired up with one of them, and they helped us weave our own bracelets! It was so cool. The woman I worked with was so sweet. I had no idea what she said at all, but I just kept telling her things about our trip and how great things were in english even though I knew she didn’t understand either. She had a great smile and it was great working with her. After we finished weaving our bracelets, I thanked the woman I was working with and we walked through cluster of houses where they lived. We went inside a house and got to look around. It was then that I realized that what I was seeing was unbelievable poverty. The house was hardly big enough for a few people, and had no furniture. There were no windows or chimneys, and the people often had respiration issues. There was no running water. It was hard to understand and accept that people were living in these conditions. I realized that these women put on their traditional dress and work hard on their beautiful creations for people like me and the rest of the group, who have come to learn about peruvian culture. It surprised me that people with such unique and incredible talents are forced to live in such poverty. But at night, when they go back to their houses, they have to live in these conditions, without a bed, water, or even fresh air. I was truly taken aback, and humbled to have met such simplistic happy people who live with so little, and wish so badly that I single handedly could have helped them in that moment. Here is a picture of the women, seated, working tirelessly on their wonderful creations. This is a woman stirring a pot of yarn. 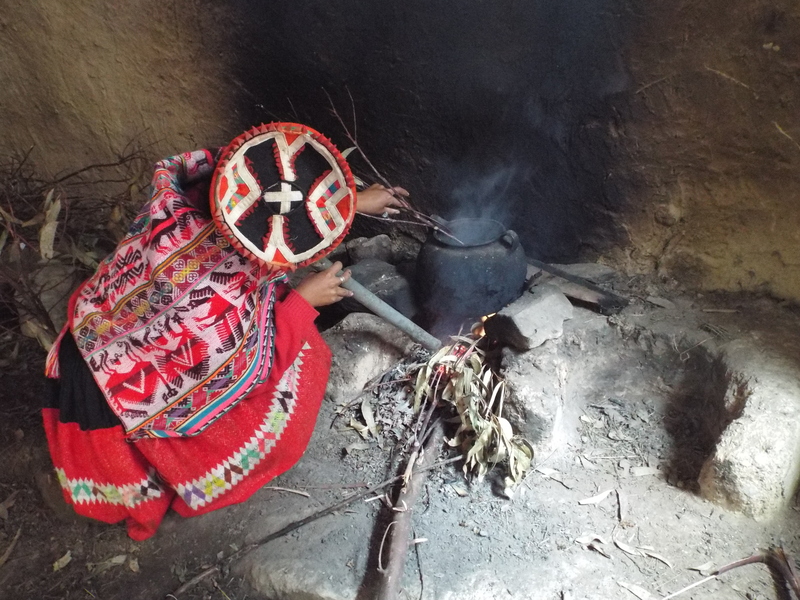 She has just added the natural dye which she extracted from a plant and is now mixing it into the pot. 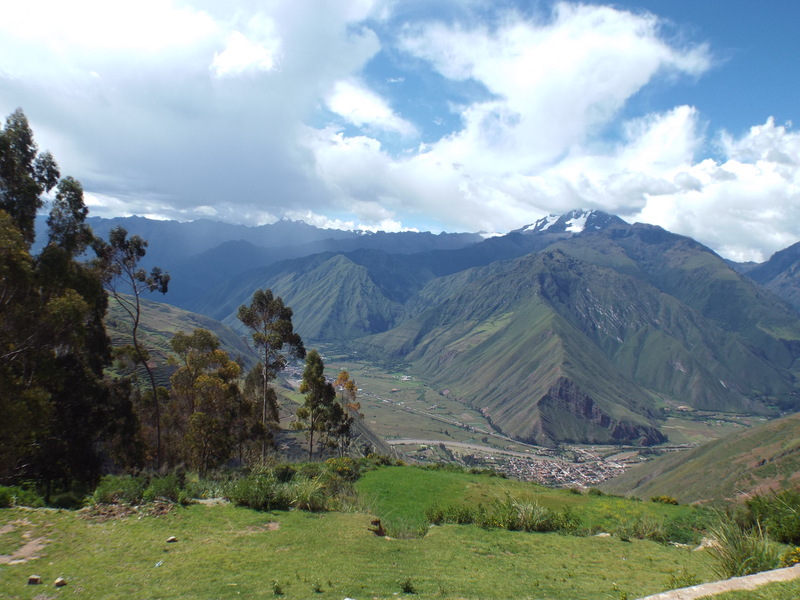 The good news: Our fantastic group of 21 has safety returned to their homes after two amazing weeks in the small town of Ollantaytambo, Peru. The bad news: It’s over. Looking back on the past two weeks is such a whirlwind of happiness, amazement, fresh air, and friendships. The best two weeks of my life flew by and the lessons we learned and people we met will stay with me forever. Because of our “unplugged challenge,” we did not have internet on the trip, so I will be sharing my favorite experiences in chronological order. I could see the them the second I jerked awake from my hours of unconsciousness on the plane and I was immediately in complete awe. Mountains were never really on my mind in terms of the things I thought would take my breath away, but as I stared, jaw dropped, I realized that I had never seen a mountain before. My family has never gone skiing, and we usually revert to our little New Jersey beach house that we all love so dearly. But this was something so new, and so incredibly beautiful that I had not expected to be so astonishing. They were everywhere, surrounding me in all directions and at incredible heights. They completely tower over the small towns that reside in their narrow valleys, and seem to rise at a vertical angle out of flat ground. They were monstrous, obstructing the view of the sky, and they were so especially beautiful. This is a picture I took at a rest stop before we reached the hotel. You can even see the snow peaked mountains in the distance! We hustled and bustled throughout our new hometown all morning long. Javier and Randall, our two guides, gave us a scavenger hunt that both made us work together, and attempt to navigate the town of Ollantaytambo. As we walked around the town, I loved seeing how people lived, and their everyday wear. Many of the women wore traditional clothing, decorated with countless colors and intricate patterns. I had so much fun wandering the streets, observing and trying to communicate with the towns people. Although I don’t speak Spanish, one of my favorite parts of this day (and throughout the whole trip) was finding ways to communicate with people in other ways besides language. Going into the trip, I knew that the language barrier would be my hardest obstacle and biggest setback, and being put in these situations forced me to learn and grow. My favorite part of the third day was the Despacho Ceremony. We all met in a hostel near our hotel, called the Full Moon Lodge. When we walked in, there was an older looking man sitting on the couch wearing a poncho covered in magnificent colors and designs. He wore a hat too, and had a thick beard. The hostel was beautiful, and there were dream catchers hanging from the ceiling everywhere. We all sat in a circle on the ground around him. He began to speak in detail about our world, and T. Maria translated. He compared the North to an eagle and the South to a condor, explaining that eagles kill and devour their prey without any appreciation, while the condor honors their prey, and fills the land with spirit. He urged us to learn about the Native Americans that live in the north, saying that we are too wrapped up in our material things. At one point he looked at us right in the eye and said, “Look at what you are wearing, you have no memory.” He then pointed to his clothing and said, “Look at what I am wearing, this is my culture.” He told us that if we went and learned our culture, we would then “receive our memory.” Listening to him was very humbling. In that moment I was so glad that I didn’t have my phone or my computer, and that I was taking part in the unplugged challenge. I felt saddened that our society relies so much on our material world, and because of that we are missing a huge part of our culture. He said, “When the day comes that the rich material north collides with the poor spiritual south, that will be the day that we save the world.” It made me think a lot about the unimportance of the things we own, and about the importance of the people we are. After about an hour and a half, he proceeded to lead us through a ceremony, where we each had to wish on coca leaves (a plant that is used for many spiritual and healing purposes), and place them in a pile of things that represent things like good health and happiness. After we each presented out wishes, he blessed it, and then burned the package in the campfire, releasing our wishes into the atmosphere. Many people in the group were moved to tears during the ceremony, and I felt like I walked away having learned an important lesson. Maybe the wishes will even come true. The Despacho Ceremony was a very cool experience, and I am so grateful that I was able to experience it. 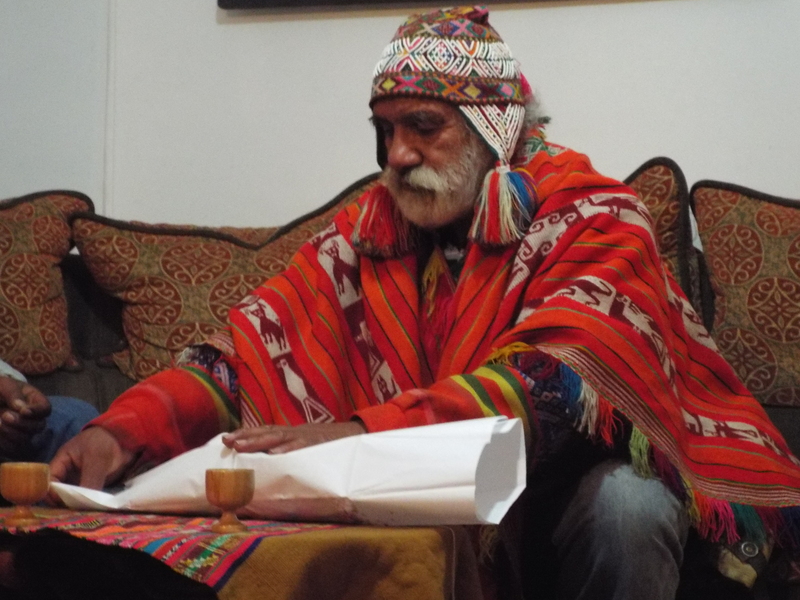 This is the picture of the shaman, who was wrapping up our pile of leaves and other natural substances that represented our wishes.